Our highest goal and most ardent wish is to love and fear God and serve his creation without distinction of race or religion, caste or creed, cause or country, gender or social status. 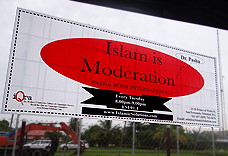 To seek to bring hope and a sense of moderation to Islamic movements, organizations and individuals around the world, for moderation is the true nature of Islam. To work for peace on earth and in the lives of every one of God’s children, regardless of who or where they are. To interpret the world to Muslims and to interpret Islam and Muslims to the world, for the Muslims and the world need each other and Islam is the medium through which both can best relate to each other. To build cultural and emotional bonds between the Muslim world on the one hand and the Western world on the other hand and to showcase to both parties their close interconnectedness and utter interdependence. To increase understanding, respect and cooperation among the races, religions, nations, societies, cultures and civilizations of the world. To invite the world to celebrate its commonalities and to resolve its differences peacefully and legally through mutual negotiation and compromise. To make truth, justice and fairness a common heritage of humanity throughout the world and to teach everyone everywhere to speak the truth and stand up for justice and fairness for all. To take the Qur’an to every home and heart that needs it – and which one does not!